I don’t like milk. But I love buttermilk. I believe it has amazing superpowers when it comes to baking and cooking. I’ve been in kind of a funk when it comes to breakfast making. In fact, the other day, Ben told me that he was tired of the same breakfast everyday. I would usually take offense to this comment, and tell him the usual “You get what you get. And you don’t throw a fit”. But before I started to say this, I couldn’t remember the last time I made him something other than the usual toast with a fried egg. So this past weekend, this crispy on the outside, tender on the inside, maple syrup bathed deliciousness was made. I do have a favorite waffle recipe. But it’s a yeasted batter so you need to make the batter the night before so it has time to rise. Not a good thing when you didn’t plan ahead, which is usually me. So I looked through Pinterest and found this amazing and simple recipe. And let me tell ya, it’s so good. The cornstarch in the recipe really allows for the desired crispness. The recipe does call the batter to sit for 30 minutes but I let it sit for 10 since I had a son whining in the background, “I’m staaaaarving.” It still came out crisp and tender. Actually, Ben ate an entire waffle which is pretty big since it was made in belgian waffle maker. On that note, I got 2.5 waffles made in the belgian waffle maker. 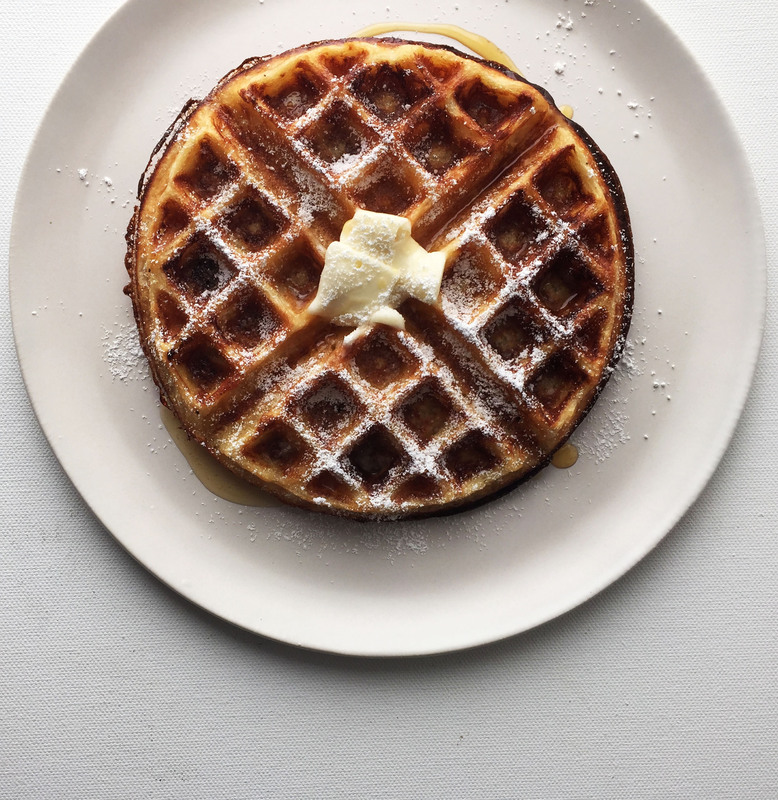 So you if you have a regular waffle maker, it will make…well, a lot more :). Please do let me know how many it makes. Don’t forget to drench it in maple syrup, butter and powdered sugar. Hey, I never said it was a healthy dish. In a medium bowl, combine the flour, cornstarch, baking powder, baking soda, sugar, and salt; mix well. In a separate bowl, combine the buttermilk, butter, egg, and vanilla and mix well. Add the wet ingredients to the dry. Stir together but do not over mix. Let the batter sit for 30 minutes. Preheat and grease a waffle iron. Follow the directions on your waffle iron to cook the waffles. Serve immediately with butter and syrup. 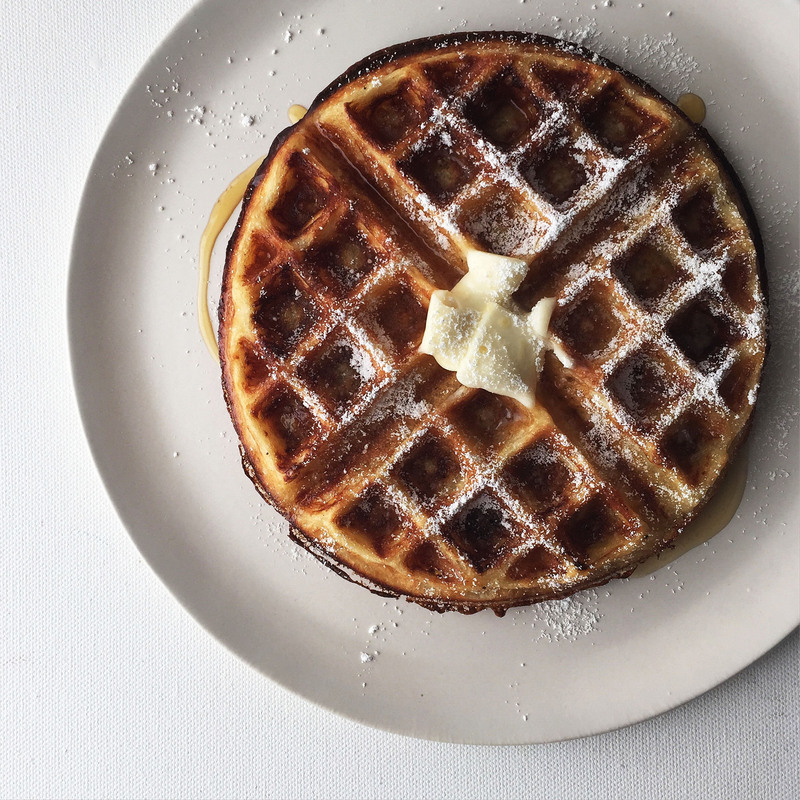 This recipe makes 2.5 belgian waffles.